The human body is asymmetrical by nature. From the top of our head to the tips of our toes, most of us have parts that are not quite equally the same. 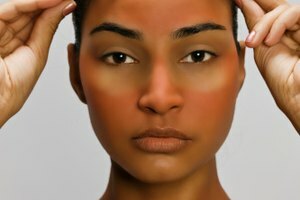 Although mother nature dealt most of us with this hand, there are times when we want to bring more balance to our features. 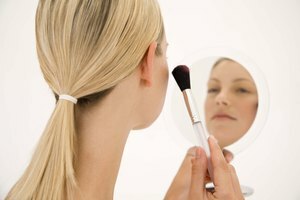 Using simple makeup to hide asymmetrical eyes is relatively easy by using a few tricks and guidelines. Apply liquid eyeliner to each eye. Start at inner part of the eye and move towards the outer edge, making the eyeliner thicker towards the outer corner. Apply the eyeliner thicker on the smaller eye, to give the illusion of both eyes being the same size. Add eyeshadow to the eyes. 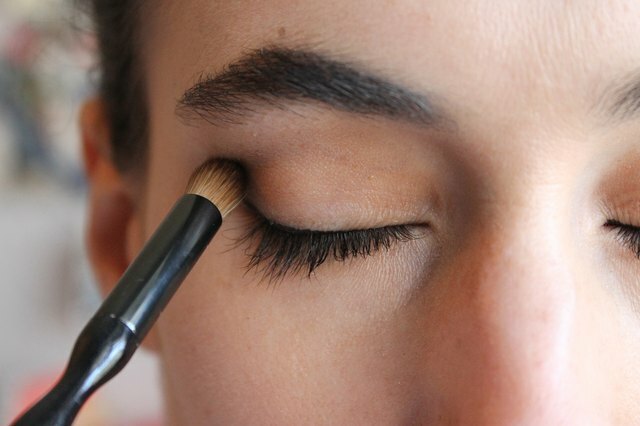 Place darker eyeshadow on the crease of the smaller eyelid to match the other eye. Soften and blend the makeup lines really well, avoiding precise, clean-edged lines that may attract attention to the asymmetry. Curl your eyelashes. Use the curlers, especially for the smaller eye's upper lashes, to open the eye. This gives the eye look bigger, and makes the eyes appear to be the same size. Affix false eyelashes to the outer corners of your upper eyelids. 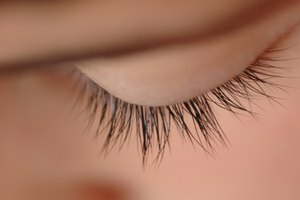 Dip the end of the false lashes into lash glue. 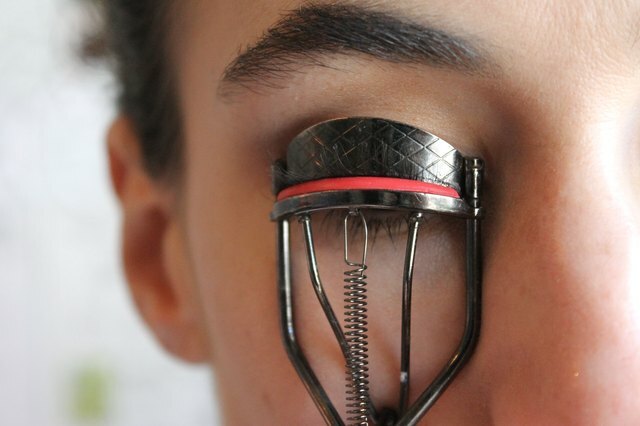 Press into the upper lash line and hold for 30 seconds. 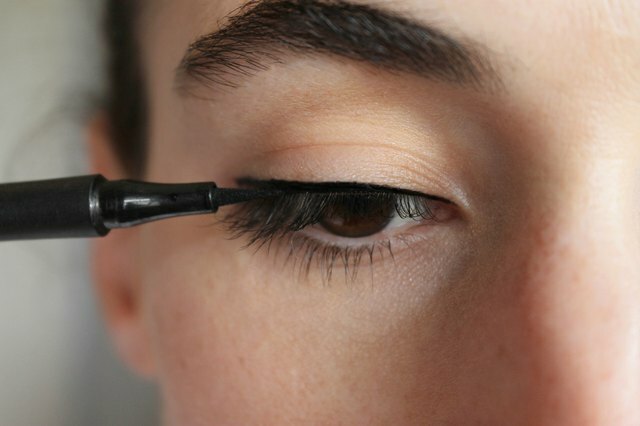 Apply one coat of mascara to bond the eyelashes together. Creating bold lashes detracts from the asymmetry and gives your onlookers something else to focus on instead. Make an asymmetrical part in the hair where your bigger eye is located. The hair will fall next to the smaller eye, and bring balance to the face as a whole. Your eye makeup will look crooked but do not worry. 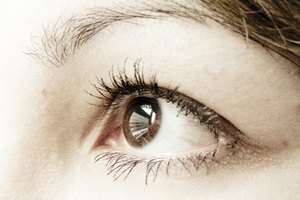 You are compensating for the different shapes of your eyes. Symmetry is definitely more of a concern than makeup application. 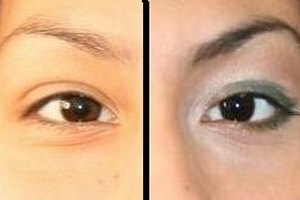 Lovelyish: Do You Apply Crooked Eyeliner to Even Out Crooked Eyes? Michelle L. Scion has been a freelance writer since 2006, specializing in beauty, fashion, culture and travel. She has provided her expertise to local media such as "The Plain Dealer" and Fashionably Cleveland Magazine. Scion studied journalism at Notre Dame College of Ohio and is pursuing her license in cosmetology.